Pee Wee had a playhouse, and now your cat can have one too. The Kitty’s Purrfect Playhouse is a multi-function playhouse for your cat to eat, scratch, nap, or play in. 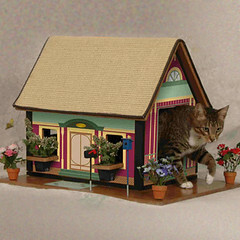 The mailbox and birdhouse are even spring-action, so your cat can be stimulated throughout the day. Your cat can also use it as a place to escape from the dog. This entry was posted on Thursday, May 24th, 2007 at 12:00 pm	and is filed under Cats, National Dog, Cat & Pet Info, Products & Services for Cats & Dogs. You can follow any responses to this entry through the RSS 2.0 feed. Both comments and pings are currently closed. $159.99??? My cats already have a playhouse. Its a big brown box that UPS brought.